Pompeii, also known as the forgotten city, was a Roman settlement that was devastated by volcanic eruptions in 79 A.D. It is located in the province of Naples (Campania, Italy). The city was first occupied by Romans in the 6th century and converted into a resort city. Today, it is an attraction for archaeologists from all over the world due to the fact that most of the architecture has been preserved by the ashes from the volcanic eruption. The volcano that was responsible for the destruction of Pompeii is Mount Vesuvius. The eruptions from the volcano were so strong that the buildings and the people were covered in twelve thick layers of mud and ash. After the city was covered in volcanic ashes, it was slowly forgotten and erased from the history books until it got rediscovered in 1738 by workers working for the King of Naples. Since then, it has become one of the earliest excavated cities in the world. Before Pompeii succumbed to the eruptions, it was a blossoming township and a progressive commercial port of the Sarno River in Italy. The most notable buildings that have been excavated from the ashes are a Roman basilica and an amphitheatre. The excavations also include many intact wall paintings, pottery, and coinage. In today’s world, the University of Bradford is responsible for most of the excavations and provides the history of the great city in the form of photos available on the internet. 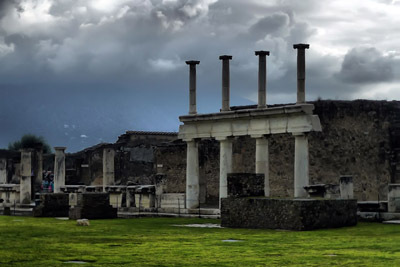 The city of Pompeii is a highly-visited tourist place due to its unique architectural designs and its history. This city was great I think nobody should forget it. I really wish that i can go to this wonderful city! POMPEII IS AWESOME I REALY WANT TO GO THERE!!!!! I H8 POMPEII AND YE I WANNA GO THERE I WILL SMASH U M8 OK CHICK!!!! pompeii was a great city and we all wonder how th evolcano started love pompeii lots lol have good luck. In the Pompeii volcano lots of people died which was very sad. I WOULD LOVE TO SEE A VOLCANO!!!!!! Pompeii is an exciting place, but the history about the volcano, Vesuvius is way more exciting! When you click the picture of Pompeii, its so awesome! I’m 2/4 Italian. And I love learning about the coutrny which one side of my family originated. This is a spectacular website! I reckon this city was great when i flew over it, it was a great trip everyone should have one day. hey well…im part Italian and I LOVE learning about Italy 2… and even though what happened is EXTREMELY sad! It’s really cool to hear about what happened to this place. I mean the people were pretty much living on a volcano and didn’t even know it…it’s just amazing! I wanna go there SOOOOOOOOOOOOOOOOOOOOOOOOOOOOOOOOOOOOOOOOOOOOOOOOO BAD!!!!!! Making a poster on pompeii, need to know why people would go there in that time, help needed, anyone know anything about this subject? Pompeii, also known as the forgotten city, was a Roman settlement that was devastated by volcanic eruptions in 79 A.D. It is located in the province of Naples (Campania, Italy).The city was first occupied by Romans in the 6th century and converted into a Resort city. The Pompeii city is an attraction for archaeologists from all over the world due to the fact that most of the architectures has been preserved by the ashes from the volcanic eruption. The volcano that was responsible for the destruction of Pompeii is called Mount Vesuvius. The eruptions from the volcano were so strong that the buildings and the people were covered in twelve thick layers of mud and ash. After the city was covered in volcanic ashes, it was slowly forgotten and erased from the history books until it got rediscovered in 1738 by workers working for King of Naples. I SAW THE PICTUERS OF POMPEII AND FACTS ABOUT MT.VESUVIUS A LONG TIME AGO I’M SORRY TO THE PEOPLE’S WHO WAS THERE A LONG TIME AGO I LOVE THE CITY. POMPEII WAS SO COOL I WENT LAST SUMMER!!!! ITS SAD BUT AWESOME AT THE SAME TIME…… U NEED TO VISIT IT WILL CHANGE UR LIFE FOREVER. Let the haters hate, your way too late! THIS PLACE ROCKS go smash it if u want because everyone knows u can’t do anything to this awesome place coz u are such a wimp and your only a 2 year old this place is so interesting and exciting it puts me back into perspective of what this place was like so u obviously have no idea how amazing this place is. pompeii was once a great city(: i just feelbad for all those ppl to die like tht… but the funny thing is tht archeaoligists found bread still in the ovens from the day that they were cooking. i am a quater italian and i have been to italy,vesuvius and pompeii its worth going there ,its an amazing place! the bodys,and the buldings are still there and standing,and very clear to see its fantastic!